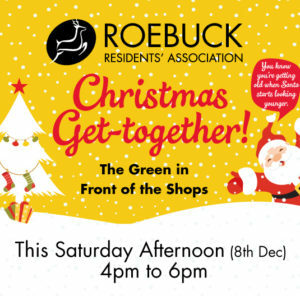 Yes, it’s Christmas Get-together on the Green time again! Get yourselves down to the green in front of the shops next Saturday (8th Dec) from 4pm to 6pm for our awe-inspiring Christmas event. Kids are invited to come down to the green between 2.30pm and 3.30pm to make their very own swag. Please bring some foliage and decorations etc. to personalise to your own taste (there will be some foliage available on the day). They can then come back to the green at 4pm to meet the big red beardy man. Adult supervision is required for younger children. Can all children please bring a bauble with their name on it to place on the Christmas tree. This event is kindly part-supported by Dún Laoghaire-Rathdown County Council.